There are two kinds of stock screeners - ones that are free and ones that are not. Surprisingly, not all the free screeners are capable of screening for a simple investing strategy like the Tiny Titans. One of the reasons for using Tiny Titans as an example is the simplicity. If a stock screening tool cannot handle Tiny Titans, it may not be capable of supporting more demanding strategies. By changing the criteria or with some additional manual effort, the above screeners can still manage a variation of the strategy. 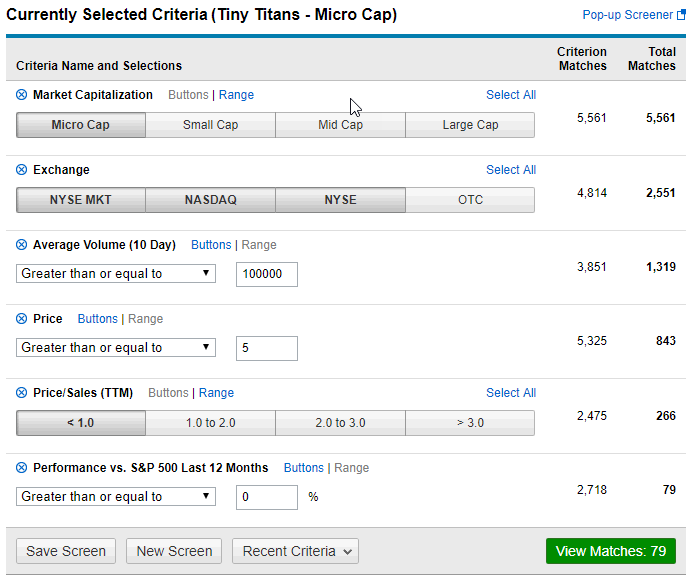 To illustrate building a work-around, a variation of Tiny Titans using CNBC's screener was implemented. Screeners provided by your broker may also run the Titans screen. For example, if you are a Charles Schwab client, their screener is free to clients and can screen for Tiny Titans. Below is the Schwab stock screener set up for Tiny Titans. It is possible to set the market cap range from 25M to 250M, but the example uses the Schwab default for micro cap stocks. Adjust the performance limit or sort the 79 passing companies by performance to reduce the list of passing companies to 25. The Value Line Investment Survey was not considered for the Tiny Titans screen since it deals primarily with larger cap stocks. The data fields are present to do the screening but, with the large cap universe, few companies would pass the screen. FinViz - A free screener which uses a fixed limit for P/S. No industry relative valuations are offered. Morningstar Premium - A fee-based screener able to meet all criteria. Back-testing is not available, but the proprietary Morningstar ratings can be used for a variation of the strategy. Portfolio123 - Fee-based stock screening tool which offers, screening, multi-factor ranking, back-testing as well as simulation. Stock Investor Pro - Because it has back-testing capabilities (clumsy to be sure) and the historical data does not suffer from survivorship bias, AAII's tool is a great choice for Tiny Titans if you are paying for a screener. There is a pre-built screen. Uncle Stock - Fee based product with back-testing. Multiple world markets are available and the screens can be applied to any market. VectorVest - Fee based product with back-testing. Note that the back-testing suffers from survivorship bias but still provides some insight into historical strategy performance. Not substantial fundamental choices. Worden’s TeleChart - Fee based tool with emphasis on technical analysis but with enough fundamental data to be worth consideration. An additional Worden's product is necessary for back-testing. Like VectorVest, is suffers from survivorship bias but does provide some insight into historical performance. Tiny Titans is a well-researched investing strategy published by James O'Shaughnessey in What Works on Wall Street. For an up-to-date view of the strategy, check out O'Shaughnessey's Asset Management site.